Mt. Kasayama is 112m height smallest volcano in the western country located in the middle of the Kita Nagato sea shore National Park. On the basaltic plateau, it has the smallest caldera with 30 m diameter and 30m depth. It tells you the memory of eruption 8800 years ago. The mountain has a lot of nature and famous places here and there and it has various kinds of different faces in the four seasons.The foot of the mountains has limestone cave from which the cool air comes out in summer. Even in the middle of the summer, the air temperature is lower than 15℃, and a lot of tourists take-rest spot in the base of the caves. In the north foot of the mountain, the tree of Kourai tachibana grow wild and they are 110 to 120 years old. Those trees are Japan’s national natural memorial tree which grows only here in Japan. From the foot of the mountain, where there’s Myojin ike pond, a 3.5 km trail leading to the top of the mountain passing through the north-west Toragasaki. You can enjoy the beautiful Japan’s ocean and the nature. Mt. Kasayama is an active volcano belongs to Abu volcanic group of monogenetic volcanic group which you can find less numbers of volcanoes in Japan. 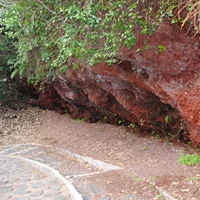 The scoria cone on the basaltic plateau. 30m diameter and it has the smallest caldera with 30 m diameter and 30m depth. The era of the eruption of each part is ranged widely, and Mt. 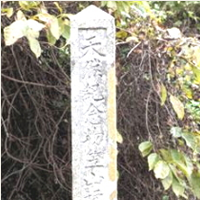 Kasayama as of now is considered to be formed about 10000 years ago. It doesn’t have current action recently. You can use the stairs goes down to the caldera on top of the mountain and also, you can walk around it in 2 minutes on the trail. 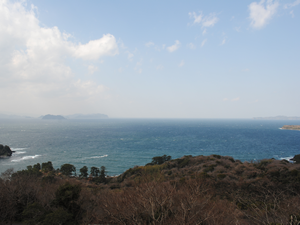 From the observation platform, you can see the islands of the Abu volcanic group and you can see the shoreline on Japan Sea from both sides of Kyusyu/ Shimane prefectures. In the morning, you can enjoy the atmosphere of sunlight reflection on the cliffs of the islands. 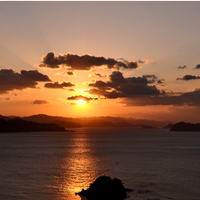 In the evening, you can enjoy the sunlight sinking in the direction of Japane Sea. In the night, you can enjoy the light of the Squid fishing boat and you can enjoy the beautiful scenery of Japan Sea. They chose the beauty of the sunset as Japan’s best 100 of the sun set. The smallest volcano in the East. 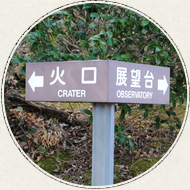 You can walk down to the crater to observe it. From the observation platform, you should feel the magnificence of nature in the scenery. From years ago, according to the eruption of the Mt. Kasayama, the main land and the mountain got connected with the grit piling up and then it formed with natural pond of 11550 square meters. 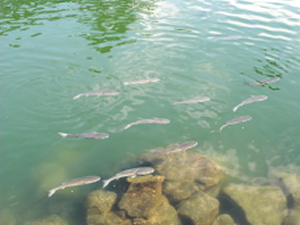 Since it has crack of the lava at the bottom of the pond, the sea water is coming in and out, various kinds of fish like a parrot fish, a striped mullet, a ray, flathead, sea bass fishes, so they call Myojin ike pond as Natural aquarium with red sea bream. 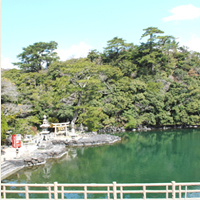 Stores around this myojin ike pond, they sell the food for the fish and if you put out your hands, many fishes swim closer. This is a scenic spot for young children to the adults. Please watch out with the kite birds flying about above the pond. 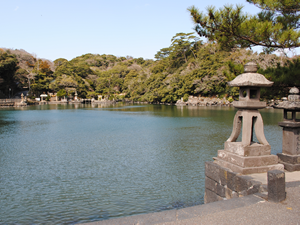 ※You are not allowed to fish here because it is a national natural treasure lagoon. From the crack of the lava at the bottom of the pond, the sea water comes in and out, and you can see various kinds of fish you can find in the ocean. Above your head, there are some kite birds flying about so please watch out. On Mt. 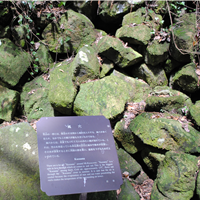 Kasayama, there are countless numbers of various kinds of limestone tunnel, from which cool air issues in summer, formed with the lava came out from the volcano. From the small cave, during the middle of summer, you can feel the cool air around 13℃ floating out. The reason is, the rain or the sea water filtrate through the porous rocks which forms the mountain and when it evaporates, it takes off the heat from the rocks. It makes you feel comfortable with the 13℃ of the air, they call it natural cooler. In the north edge of the Mt. 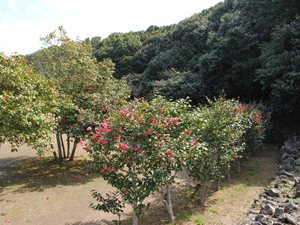 Kasayama (Toragasaki), 25,000 Yabu Tsubaki Camellia trees grow wild in the 10 ha width. Government of domain of Hagi, Mt. 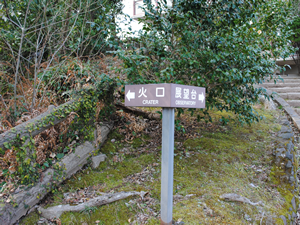 Kasayama is in the direction of north east of Hagi castle, and the direction is called demon’s gate in Japan, so they prohibited to cut down the trees in Mt. 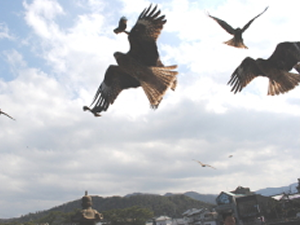 Kasayama or capture the birds or animals. Because of that, the mountain has the scenery with virgin forest which was surrounded by huge trees. 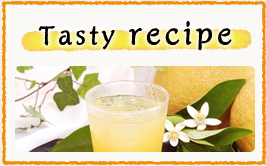 In Meiji era, the prohibition was drawn and the huge trees started to cut down and they became lumber. The miscellaneous small trees were made into charcoal. Then, the mountain doesn’t have the trace of old time. 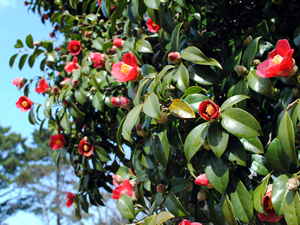 The camellia treees here in Toragasaki were cut down many times with the small miscellaneous trees around the place. 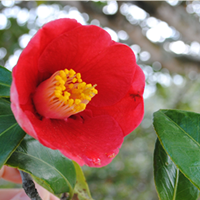 The sprout comes out from the stump of the tree cut down and you could have seen the camellia red flowers in the miscellaneous trees until the year of 40 of Showa(1965) . Inside of the tree of the camellia, there’s an observation platform of 13m height. (It could be 5 storied building) From here, you can view the Japanese ocean, Hagi’s islands of Hashima, Aishima, Oshima in the Japanese ocean. 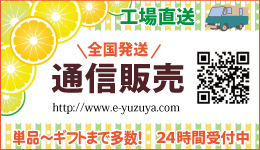 【 subaki Camellia trees in colonies 】 From Yuzuya Honten, it takes 50 min of walk. 7 min of driving. 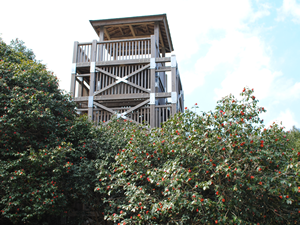 From the observation platform, you can view the Camellia trees in colonies and the islands in the ocean. Kourai Tachibana is an evergreen tree and the trunk stands straight. 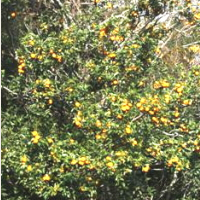 It is a rare fruit tree inhabit in Chejyu island and this land. Registered place is in the north of Kasayama Hagi and inside of Kasayama, it grows outside of the place. 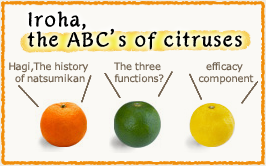 Years ago, it is called Yamamikan, which stands for Mountain citrus, used in the decoration of New Year’s day. There’s no doubt it grows wild. The number of tree is lowering because of the exploitation and the suffering from a fire and they there are only 8 grown up tree there. There is an old tree of 110 to 120 years old and it is 7m of high and the girth of trunk is 1m. 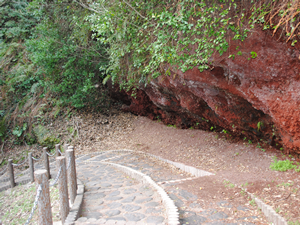 You can find it at the point of 600 meters from the entrance.